Climate science denial is in a sorry state when big name deniers screw up the simplest of right-wing talking points. Take Stephen Moore [please!] “” the Wall Street Journal editorial board member, Cato Institute senior fellow, National Review contributing editor, and regular CNBC and Fox News commentator. He was on the Diane Rehm radio show Wednesday about climate change impacts in the United States, with Obama science advisor John Holdren, American Progress president John Podesta, and Bush environmental advisor James Connaughton. As you’ll see in this post from Wonk Room, Moore has no clue that the “1930s was a warmer decade than the last decade” talking point ain’t about global temperatures (see “Must read from Hansen: Stop the madness about the tiny revision in NASA’s temperature data!”). What I object to about this report is some of the language in this is sort of almost Stalinistic, that there’s an unequivocal conclusion that it’s inarguable that this is happening, that there’s overwhelming agreement among the scientists. None of that is true. Moore also cited the repeatedly debunked Oregon Petition and Bjorn Lomborg’s Copenhagen Consensus, arguing it is “highly irresponsible” not to debate the science of man-made climate change. Even though Dianne Rehm admonished Moore for his anti-science outbursts, he continued to pollute the airwaves with Pollyannish complacency . . .
– We’ve talked about global warming as climate improvement. – The good news is that the bad news is wrong.
. . . an endless stream of discredited lies about global warming and carbon pollution. . .
– John just said nine of the last ten years are the warmest on record. That just isn’t true. In fact, they’ve gone back, and it turns out NASA made a mistake in the model which didn’t get any publicity. John, actually, the truth is the 1930s was a warmer decade than the last decade. – If there’s a slight uh, global warming trend “” and we’re talking about relatively slight, heh “” John, there’s just no question that the slight warming of the temperature actually improves agriculture, it doesn’t hurt agriculture. In fact agricultural output would go up. – In fact, I’m old enough to remember when the scientific consensus that there was going to be cooling, remember, in the 1970s we’re going to have global cooling and we’re all going to starve to death and we’re not going to have agriculture. So you can’t, heh, have it both ways. You can’t say cooling is going to hurt agriculture and warming is going to hurt agriculture. 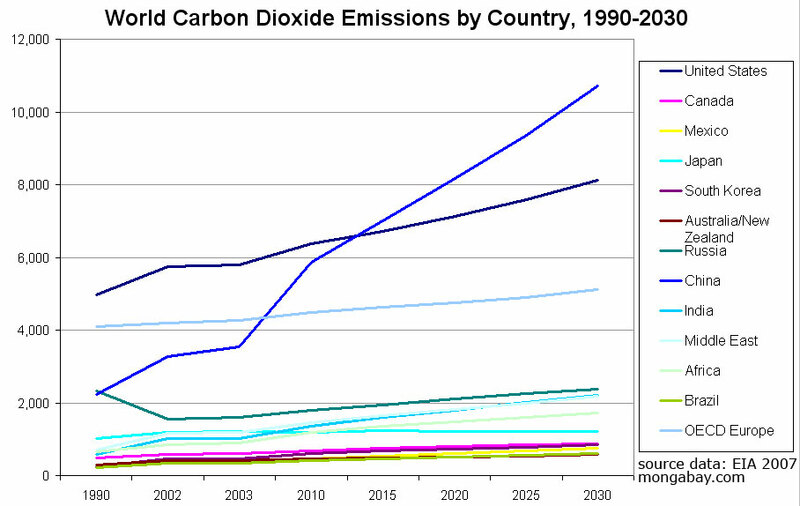 – We’ve reduced carbon emissions more than Europe has.
. . . apocalyptic and false warnings about the cost of action . . .
– I call it economic hari-kari for this country. – The economic consensus is this will affect middle class families in a very negative way. – The one thing I want people to be very clear on: If we do something like the cap and trade, it’s going to cause a gut-wrenching decline in the number of jobs here and it’s going to cause a decline in people’s living standards. Maybe that’s something we need to do to deal with global warming. It’s going to mean the cost of filling up your car, gasoline costs is going to go up, the cost of heating and air conditioning your home is going to go up, the cost of um, the cost of uh, buying any good or service that’s produced here will go up, because energy is a part of it. – I was in Wheeling, WV, going down the Ohio River. That’s the epicenter of the Rust Belt in America. Steel factories, chemical plants. A big coal-fired power plant. By the way, John, that’s Democratic country, those are Democratic votes. If we do cap and trade, that’s all wiped out. – The reason I think John and a lot of Democrats don’t want to do [a carbon tax] is there’s a bit of dishonesty here, you hide what the tax really is. – To use this term “denier” is to put down the debate. I happen to believe that global warming is the biggest scam of the last two decades.